The Griffith Park Observatory as seen from one of the many trails in the park. On December 16, 1896, a Welsh Colonel named Griffith J. Griffith gave the residents of Los Angeles an early Christmas present: 3,000 acres of wilderness from his Rancho Los Feliz estate. As far as I can tell, no other civic-minded gift has yet to top Griffith’s in the region’s history. Subsequent gifts and acquisitions have grown the park to over 4,000 acres, making Griffith Park one of the largest urban parks in the country. By comparison, New York’s Central Park is 843 acres. In its hundred-plus years, Griffith Park has hosted some historic and bizarre functions. It was the site of an ostrich farm. And, improbably, an aerodrome — which Griffith set aside to support advances in early aviation. Hiking into the rugged hills and sparsely developed areas is perhaps one of the most popular forms of recreation in Griffith Park. One of the most rewarding hikes in the park is the trail leading from the Observatory parking lot to the summit of Mount Hollywood, the highest peak of the park, which affords spectacular views of the entire Los Angeles Basin. Thanks to Metro and the Los Angeles Department of Transportation (LADOT), the Mt. Hollywood hike and several other trails are within easy transit reach. 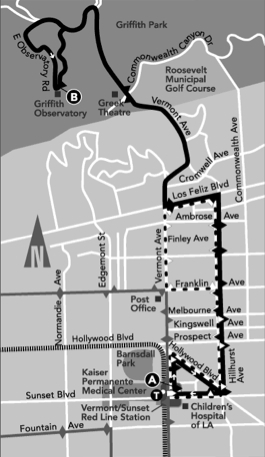 On Saturdays and Sundays, LADOT operates its Weekend Observatory Shuttle from the Vermont/Sunset Red Line station to the observatory, making stops along the way — including at the park entrance. From roughly 10 a.m. to 10 p.m., the shuttle runs every 35 minutes. During that time, the Red Line runs as often as every 12 minutes and at 20 minute intervals later in the evening. Be sure to check the time table [pdf] when planning your trip. To pick up the Mount Hollywood trail, simply ride the Observatory Shuttle to its terminus at the observatory. From there, head due north on the dirt road that exits the parking lot and follow it for about a quarter of a mile to the bridge over Mt. Hollywood Drive. As the dirt road veers left, keep following it for another 1,000 feet, then pick up the smaller hiking trail that branches off to the right. This path ends at an intersection of several paths; Mount Hollywood itself is just 500 feet further north up the hill. A Google Map of this route can be found here. Now, as you pause a moment to catch your breath, you can take in the sweeping 360-degree views. On my trip — which came on a clear day shortly after a rain storm — visibility extended some twenty miles to Long Beach and I could even make out the massive cranes that unload cargo containers at the ports of Los Angeles and Long Beach. And that’s part of what makes Griffith Park so special. Unlike some hikes in the L.A. area, those in Griffith Park make you really feel as though you’re in an expanse of wilderness sitting atop the city. To me, that thorough interweaving of city and wilderness is a central experience of Los Angeles and part of what makes it unique among American cities. The view of downtown L.A. from Griffith Park. But if scaling a mountain isn’t your thing, you can find an impressive assortment of other recreational activities. All told, there’s the Los Angeles Zoo, the Museum of the American West, the Greek Theatre, a golf course, tennis courts, hiking trails for all skill levels and of course the revamped Griffith Park Observatory. Maps of trails and current information on trail closures and special restrictions are available at the Ranger Station, (323) 913-4688. All trails in the park are closed at dusk. Open fires and smoking are not allowed. Hikers should approach the park with caution; Griffith Park is a wilderness area with wild quail, rodents, foxes, coyotes, rattlesnakes and deer. One last note to the serious train fans: Be sure to check out the miniature railroad!